We have worked with even more of the hottest nail bloggers out there to bring you our second round of Blogger Collaboration stamping plates. We got 5 more bloggers for this set that designed a plate each: Nailstamp4fun, Madam Luck, YaGala, Lucy's Stach and Sloteazzy. Each blogger brought their own personal style so are getting a unique, and eclectic 5 piece set with designs ranging in elegant and ultra feminine, kawaii urban graffiti, edgy and chic, florally and girly, and water marbling made easy. We are all uber excited how these XL stamping plates came out and hope to see you rocking these designs on your newest nail art manicures soon! We have teamed up with some of the hottest nail bloggers to create a 5pc set of nail stamping plates. Nailstamp4fun, Madam Luck, YaGala, Lucy's Stach and Sloteazzy each created their own stamping plate. All designs, a mix of full nail and buffet style, are on our XL sized plates (4.75 in. x 2.4 in.). The best top coat i have ever used. My opinion the best on the market, seals polish with a high glossy shine with long wear and does not chip. Charp and petfect pick up and verry nice ! I love my new stamping plates! I have been doing so many cool nail designs with them. 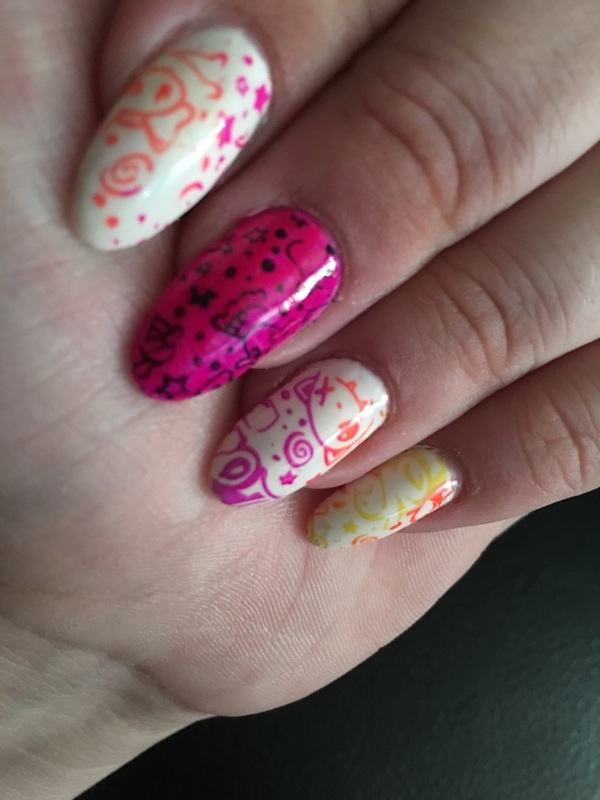 Once you get the hang of stamping in itself, these are so easy and enjoyable to use! First time using stamping plates!! I have enjoyed playing with these plates so much! I have never done nail stamping before and I must say, it has takin my nail game to the next level lol. I have no idea what took me so long!!! !